Summary (from Goodreads): One choice can transform you—or it can destroy you. But every choice has consequences, and as unrest surges in the factions all around her, Tris Prior must continue trying to save those she loves—and herself—while grappling with haunting questions of grief and forgiveness, identity and loyalty, politics and love. My Summary: After the battle that ended the lives of so many, Tris and her companions do the only thing they can: flee to Amity headquarters, where they can claim refuge from the Erudite and the Dauntless traitors. But Amity is not all that it seems, and Tris and Tobias soon realize that their only option is to leave - that or give themselves up to the Erudite. My Thoughts: Honestly, it was hard to form coherent thoughts after finishing this one. It really was. So I gave it a couple of days, and guess what? It's still pretty tough to describe how I felt about it. But I know one thing for sure: this novel was amazing. 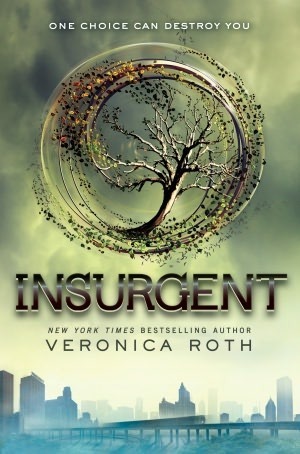 I was worried that I wouldn't like Insurgent as much as its predecessor, I really did. You know how the second book in a trilogy is nobodies favourite? (You totally do, don't pretend you don't). I didn't want that for this series, and I am so glad that didn't happen. The writing was flawless and flowed beautifully, and the depth of the characters surprised me - I never thought a written character could have as many layers as Tris and Tobias showed in this installment. And OMG, that ending! I totally wasn't expecting that. Not one bit. Final Thoughts: This series is one of the best I've had the pleasure to read in a long, long time. Do yourselves a favour and pick up the books (that is, if you haven't already!). LOL I understand what you mean about the 2nd book. It's usually a filler book. I need to read this one! A friend bought it so I'm waiting for her to be done and then I'm borrowing it. :) Great review! I finished this book myself the other day and I completely agree, it was incredible!